Our guest blogger this week is Daniel Zink, an experienced Instructor in the sport aviation industry where he has developed structured training methods and safety protocols that are now being implemented by the U.S. Hang Gliding Association and other providers in the industry. He also has over 10 years of experience implementing and managing health and safety systems in the corporate restaurant industry. Of course you are concerned about the health and well- being of your employees. 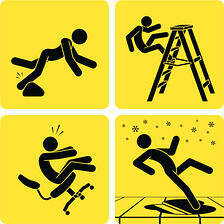 Of course you are also concerned about the costs associated with workplace injuries. So it’s a good thing you have a company full of safe employees! Right? While that last statement may be debatable, the topic of how safe your workforce actually is deserves further examination. Let's ponder 5 reasons why companies overestimate their safety culture. 1. Complacency - Your well-trained top-notch crew may be getting complacent. Everyone on your team has gone through the required safety training. Last year you even did safety behavioral observations. The lagging indicators are seemingly positive and you can look at your incident rates to prove it. That’s great! But…how long ago did you evaluate the safety behaviors of your crew? Time zooms by for a busy manager and it may have been a lot longer than you realize. Is it time for a refresher? Complacency is one of the biggest culprits affecting personal safety. Smart, motivated and safety-conscious employees can be so good at staying safe that they may start taking it for granted. How often have you thought, "I can't believe that person got hurt! That is the safest person I know!" It is probably a result of a slow, unconscious decrease in his or her safety awareness and actions. He or she doesn’t realize it’s happening, and you may not realize it either. This can be a major safety blind spot for some individuals, who are more prone to be overconfident as time goes on. In aviation, there is a saying: "It's a safe sport, as long as you remember that it’s a dangerous sport." The longer it’s been since you provided a refresher on your safety program, the more likely that complacency is developing within your workforce. 2. Optimism - You naturally think the glass is half full. Your experienced crew will surely do the right thing and stay safe. We certainly need to trust our team members and believe in their ability to avoid risks. When it comes to workplace safety, however, it pays to take off the rose-colored glasses from time to time and put on a more pessimistic hat. Make a critical safety assessment of your work force. Is everyone adhering to the same standards? Are there certain individuals that feel they do not have to follow rules? Do people generally agree on what cautious, safe behavior really is? Be brutally honest. Then place your optimistic hat back on your head and go to work on developing an even safer workforce. 3. Focus on injuries rather than exposure - You may not be tracking your near misses and close calls. While it’s necessary to track and give attention to any injuries that occur, it is also important to get a good sense of how much general exposure exists on an everyday basis. Most incidents and injuries lurk around somewhere inside the “gray area” of near misses or close calls. If you track these as consistently as possible and assign a risk percentage to each, you can better predict your chances of future safety incidents. You may find you are having many more near misses than you thought. You may also find they are being caused by circumstances and actions which you never thought were critical. And once you look further into these circumstances and actions, you may discover that some are linked to certain attitudes or assumptions that need to be addressed in order to truly reduce these exposures in the future. 4. Attributing incidents to chance rather than to behavior - The few incidents your crew had were unforeseeable oddball events where the planets must have aligned perfectly and allowed them to occur. You figure they will never happen again. It's very easy to see many safety incidents this way. It sure is easier than assigning blame to your crew or to yourself. Look back at your incidents and analyze the chain of events that led to those incidents. Usually it is a series of four or five at-risk actions that lead to an event. Now ask yourself, if each of those four or five behaviors can occur on any given day, how long will it take for those four or five things to line up and contribute to a safety incident? Address any hazards or conditions that facilitate these behaviors. Identify the employees involved in those specific actions. Is there something in their personal SafetyDNATM that contributes to poor choices and at-risk behaviors? Have an honest and constructive conversation with them about these things. These types of proactive activities can help strengthen each layer of defense against future incidents or injuries. 5. The Supervisor Effect – Many members of your team may think differently and act safer in your presence because you are the boss. What happens when you are not there? Does everyone still follow the rules? Does everyone still exhibit caution and stay in control of their safety when no one is watching? The old saying is, "The boss is coming, look busy!" As workplace safety becomes increasingly more important to organizations, it’s often more like, “The boss is coming, quick, put on your safety gear! While you will always have some employees who uphold the highest safety standards without supervision, be mindful that there may be others whose behaviors change when the boss is around. Ultimately, a strong safety culture will help to reduce this issue. But in the meantime, examine the individuals that make up your workforce and assess their personal traits and attitudes that relate to safety. If an employee has the right SafetyDNA, he or she will be more likely to work safely independently, no matter who’s around. These are some of the main reasons why your workforce may not be quite as safe as you think. Unfortunately, when it comes to workplace safety, we can never let ourselves believe that we are doing well enough to just sit back and relax. Always stay vigilant and have the attitude that your team's safety skills, attitudes and practices are probably not as safe as you naturally want to give them credit for. You owe it to them.